We wanted to show more love to the non-top teams in college gym in 2019, so we broke out our Dismounts into DI, DII (all USAG nationals teams) and DIII. Each week, we’re also dishing out a few superlatives for some of our favorite moments, looks and results from the weekend of competition. Below those, you’ll find your typical results and highlights from every DII and USAG nationals-eligible team’s meet. For reference, teams eligible for USAG nationals include those with less than seven and a half full scholarships. They include, Ivy league schools, all DII teams, Air Force, Centenary and SEMO. Bridgeport is having its best season in years and junior Maya Reimers, who has not gone below 9.800 on floor all season, is an important part of the resurgence. Her set includes an incredible tuck full-in. The Owls have been on fire thus far in 2019 with the help of a dynamic group of newcomers, but we’re still amazed to see them break their program record team score in the first week of February. Mitchell’s status as one of Division II’s top all arounders is due in part to her excellence on vault this season: Her average has improved by over a tenth. This stick was a career high for her. The Big Storyline: Texas Woman’s is still struggling for consistency in 2018, even as Bria Northrop and Erin Alderman continue to excel. At this meet it was forced to count an error on floor and a few lower vault scores. Centenary had a phenomenal day, claiming a team high and beating the Pioneers on floor. Implications: Both teams will see a slight ranking improvement in the national standings but remain level within USAG. Records: Numerous Ladies set career highs, including Cami Bea Austin’s event-winning 9.775 on vault. The Big Storyline: UIC registered its third 195 in a row at home with the help of a season high 49.200 on floor. This meet was a thyroid cancer awareness meet, in honor of Mikailla Northern, who overcame the disease this summer. There was a very nice tribute to her before the meet. Implications: UIC will remain on top of both the MIC and USAG rankings. Records: Alisa Sheremeta, Kayla Baddeley and Ashley Albrecht all matched of set career highs on floor, propelling the Flames to the 195 mark. Controversies: Judging in this meet was atrocious. We saw two judges conferences, involving the same judge. One of those required the meet referee to get involved; in that case a score was raised from 9.500 to 9.750. What a mess. The Big Storyline: Lindenwood fell just short of a win over Division I NIU but was able to register a defeat of Kent State. The Lions have registered similar totals the last three weeks, and while consistency is very valuable, they’ll be looking to grow. The team would be easily capable of a 195-plus for a meet without counted errors. Seattle Pacific also had trouble, counting three errors on beam and one on vault but was still able to put together a solid total. 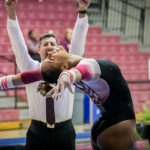 Implications: All arounder Courtney Mitchell set a career high in the all around that brings her just short of TWU’s Bria Northrop in USAG all around rankings—the dynamic between these two will be fascinating as the postseason draws closer. The Lions will step past Yale into No. 2 in USAG. 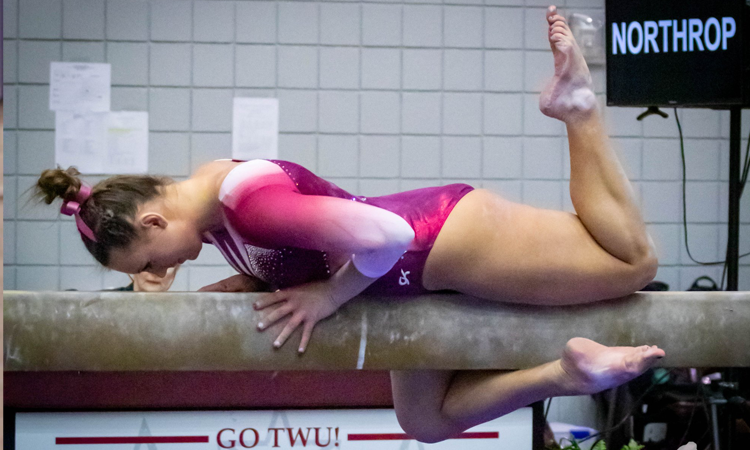 Seattle Pacific wasn’t able to keep pace with season highs from West Chester and Southern Connecticut and will drop two spots in USAG standings to No. 11. Records: Lindenwood had four individual career highs, including Mitchell and Aleah Turon’s vault scores. The Big Storyline: Air Force got a convincing win over two Division III opponents but won’t be thrilled with its total, which is the lowest of the season by three and a half points. The Falcons had some errors but no doubt also suffered from the standard of judging in La Crosse. Nonetheless, Tyler Davis had a great night, picking up three individual titles. Implications: Air Force’s lower total will mean that it drops below Texas Woman’s in the new USAG rankings, but it will only be a few more weeks before it can drop this score and try to recover the placing. The Big Storyline: Southern Connecticut had an outstanding day at the Don Tonry Invitational, recording its best team total in program history with room still to improve. Freshman Hannah Stahlbrodt and transfer Jordan Peloquin have been incredibly transformative for the Owls. Bridgeport picked up the win, continuing to excel despite two counted falls on beam: Its ability to register some of the best scores in USAG despite consistency issues this year has been remarkable. We can’t wait to see what it can do when it puts a full meet together. 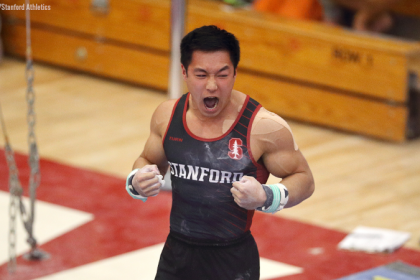 Yale was also forced to count some mistakes on beam, but its total was still respectable. 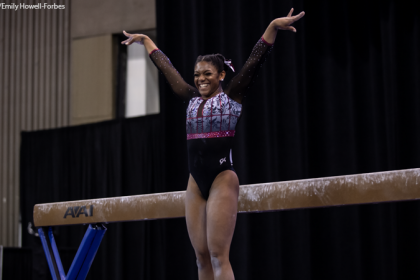 Implications: Bridgeport will rise a spot in USAG standings, moving to No. 3, while Yale will drop from No. 2 to No. 4. Southern Connecticut will pass Seattle Pacific and is beginning to look like it could contend for USAG qualification. Records: Alongside Southern Connecticut’s team program records, Cadi Borsellino tied the program record on bars. Yale’s Kiarra Alleyne registered a 9.900 on floor that was a personal best for her and No. 6 in team history. The Big Storyline: Penn had an exceptional meet, beating its 2018 season high by over a point as its exceptional freshman class begins to come into its own. Brown’s freshmen also excelled, led by Mei Li Costa with two event titles and Sophia Petrillo in the all around. Cornell had to count some errors, but its score was still acceptable. Implications: Pennsylvania will pass Cornell to move into No. 7 in USAG rankings. It’s possible for both to qualify to nationals, but they will have to watch out for the rapidly-improving Division II teams just below. Brown remains at No. 12. The Big Storyline: West Chester set a season high on Sunday and was able to stay close to Towson throughout the meet. It also bested its 2019 peaks on vault and bars. Implications: The Golden Rams will improve by one place in USAG standings to No. 9, just outside qualifying position for the national championship. 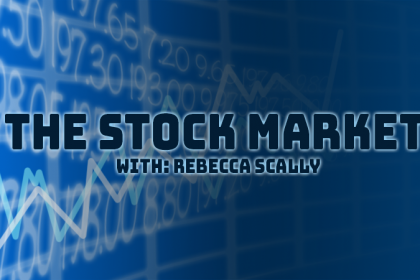 Expect things to be very competitive for the last few spots. The Big Storyline: The Centenary Ladies have improved their team score each meet so far, and an excellent day from Cami Bea Austin and an all around season high from Tavia Smith allowed them to keep climbing. They won all four events at home on Sunday. Implications: The Ladies’ strong start to the season will have to hold for a while since they will not compete again for three weeks.